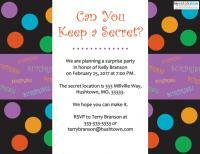 Coming up with cute and creative wording for a surprise party invitation is a great way to let your guests know the party details as well as that they need to keep the entire event a secret. Unlike writing a formal invitation letter, you can have plenty of fun with your surprise party wording and tailor it to fit the party and the guest of honor. You can have tons of fun when it comes to creative invitation wording for a surprise party. Rhymes and verses are perfect places to start with the wording. Remember to add your specific party information to the invitation as well as any special requests so that everyone invited will know what is expected from them. Friends and family are hatching a surprise to congratulate her on her next big step. We ask that you keep the secret until the big day! Regrets only to Phone Number or Email Address. The Morrison's 40th Anniversary party is going to be a great surprise! And make sure the honored guests are none the wise! RSVP to Name at Phone Number. This is your secret invitation to a surprise retirement celebration! Let's show Anthony how much he will be missed! Regrets only to Email Address. Did you hear that our friend is going away? It's only a few weeks until his big day! Let's send John off on his trip by toasting him at the big surprise bash on Date, Time. Show up early since it is a surprise! Can you keep a secret? We are planning a surprise party in honor of Name on Date, Time. The secret location is Location. RSVP to Name at Phone Number or Email Address. 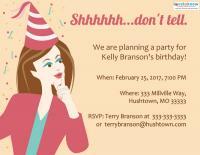 Click for this surprise birthday party invite! 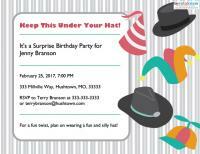 Click for the hat-themed surprise invitation. Click for the general surprise party invitation. When it comes to planning a surprise party, one of the most important aspects is the party invitations. The invitations must convey to your guests not only the who, what, when, where and why of the party, but tell them to keep all of the plans a secret as well. Sending an invitation card is often smarter than sending online invitations, as it is easy to accidently forward the message to the party's guest of honor. In fact, you can even decorate the outside of the envelope with stickers or sayings to convey that the message inside is an important secret. For instance, write "shhh" or "my lips are sealed" across the envelope flap. If you live with the guest of honor, you will need to be especially secretive about writing the invitations out. Make plans to visit the library, use your lunch hour at work or order them online with a separate email address so that the family member does not accidently find out about the party. Enlist the help of a friend who will take RSVPs for you, so you do not have to stalk the telephone when the family member is at home. Remember to fill out the invitation wording so that guests arrive at least a half-hour before the party is set to begin. This way, the guest of honor will not suspect anything as he/she arrives at the party location. A surprise party is usually a themed party, so you can incorporate wording for theme party invitations into your surprise invite. 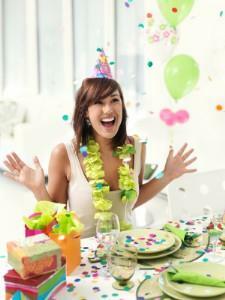 This is especially helpful if the surprise party is a pool party, a tea party or costume party. To make the party planning even easier, search for free printable invitations that already have the wording written for a surprise party. You will fill in the blanks to customize, and then simply send to your printer for a quick and simple surprise party invitation. Compose surprise party invitation wording that is fun for guests to read and gets the "surprise" message across. Even if you do not use a verse or special phrase, you can still emphasize the surprise part of the event by making the wording itself in a larger font or bold typeface.